Tomorrow we will celebrate our 51st anniversary. We hadn’t planned to do is anything special, but earlier this week I decided it might be nice to drive to Asheville. I got ticket to a play. I have also made lunch reservations at a restaurant that we like. We’ll return tomorrow night. Today we had lunch with Mark and Katherine Harrington. I had told Mark about Kate’s Alzheimer’s a few weeks ago and couldn’t help but wonder if he noticed anything different about her. I could believe not. The one thing that I think is different is that she speaks more boldly and confidently and more than she used to do. She also interrupts others speaking more frequently than in the past. It is quite difficultl for me to express precisely what this difference is, but it seems like she is working harder to make herself heard. There is also a bit of child-like enthusiasm for lots of things. One of my problems lately is adjusting to her wearing some of my clothes while she is working in the yard. In particular she wears some of my tee shirts. Once they have gotten dirty, the stains don’t come out of them. This is one of those situations I have to be careful about. I have chosen not to say anything because she gets defensive or she jumps on me for being so compulsive and overly concerned about my property. She is working hard to be on time and sometimes senses pressure from me when I haven’t done anything at all. That happened today when I came home a little early for our lunch with the Harringtons. I did this because I feared she would still be working out in the yard if I came home just in time for us to leave. At any rate, she ended up feeling pressure to get ready quickly. I hadn’t done anything to rush her because I thought we had plenty of time. At one point, she told me that it wouldn’t hurt the Harringtons if we were five minutes late. As it turns out we were on time, but she needled me because she thought I was getting fidgety over her not being ready. I confess that frequently I do get fidgety. This wasn’t one of those times. Yesterday was Memorial Day; so the office was closed. I did not go to the Y because of my back. I did take a 2-mile walk in the neighborhood. Kate and Ellen went to lunch . Then they went to a nursery before going to a movie at The Flick. I went to lunch at Panera and then to the Acura dealer to have the car serviced. I then went to the store and bought a pot roast, the fixings for spaghetti sauce, and tilapia. We had the fish last night before going to a neighborhood gathering to welcome the new neighbors on our street. While there Kate got in a conversation with two women. One of them asked if she didn’t get bitten by bugs while working in the yard. Kate told her not very much and that she used Listerine to keep them away. They acted surprised. She told them it worked for her. This is something I have ignored for quite a while. I was thinking that she got the idea by hearing that it was good for bites not as a preventive measure and that she had simply misunderstood. At any rate, I let this go because it annoys her when I challenge her on things like this. I felt awkward with the neighbors because I didn’t want them to believe it would work for them and learn later that it does not. Kate was quite sociable. She went her way, and I went mine. We both had a good time. When we got back home she joked with me that I was not the only one who could socialize. She jokes like this frequently now, something she didn’t do before. This morning we went to breakfast with the Y group. She had a good time, especially as it was ending. We walked out with a couple of people and were talking with them outside the restaurant when we saw two other people we know. We must have talked with them for 30 minutes. Larry asked her if she had been to Texas lately. We said yes, and Kate said we went to Fort Worth for one day. We did not go to Fort Worth on this trip. We did go there in December. In that case we went for 2 days. There are lots of examples like this in which the listener would have no basis for questioning what she says. 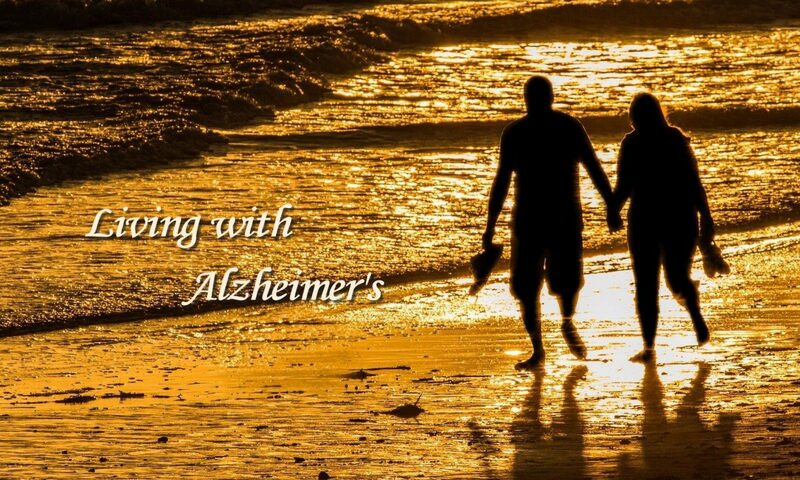 This is another way that Alzheimer’s can remain hidden for so long. Then another church friend and his caregiver, Judy, came out of the pancake house. We then engaged in conversation with them for another 15-20 minutes. Kate spoke with Judy about our getting together for lunch one day. This is something I see happening more often nowadays. In the past she might not have done it or at least not been as enthusiastic about it. This is really a rhetorical question to which I know the answer. I still find it interesting that with so many signs of problems Kate successfully conceals her Alzheimer’s from most people. The reason is that other people see such a small part of her behavior. The time they are with her involves ordinary social conversation that she is able to handle as well now as she could in the past. I, on the other hand, am with her so much and get to see much more than others. This morning, for example, she let me know that she had called Ellen to arrange lunch and go to see a movie this afternoon. Although I had told her yesterday that the movie does not start until 3:00, she had forgotten. That would mean a long time between lunch and the movie. She called Ellen, and they worked out plans to do something in between lunch and the movie. Had I not intervened, they would have worked out things on the spot. I told Kate she had an hour until Ellen was to pick her up. She said she was coming in anyway because of the heat and humidity. Thirty minutes later she was still outside. I told her she now had less than 30 minutes until Ellen arrived. She came in and started to get ready. She did a good job getting ready. Ellen came almost 15 minutes early; so she only had to wait 5-7 minutes before Kate was ready. This is part of a daily occurrence. Nothing too serious, and Ellen would probably never have connected it to Alzheimer’s if Kate hadn’t told her. Even then she may not have noticed anything. Most things are simply unseen by others. All of the entries I give point to the many things that are symptoms of Kate’s Alzheimer’s. This is unfair in painting the whole picture. In many ways she is herself. Once in a while she really surprises me. That happened this morning when I saw her rinsing out a yogurt container. This is something about which she has been sloppy. It’s not that she doesn’t do it; it is that she does it but leaves traces of yogurt which concern me because we attract insects inside and have the potential for doing the same in the recycling bin outside in the garage. I was made especially sensitive about that recently when I saw a swarm of gnat-like insects around the recycling. We are also getting gnats in the kitchen. I don’t know that I paid special attention to see that she had sufficiently rinsed the yogurt container, but when she had finished, she said, “I saw you watching me to see if I rinsed the yogurt container.” I have never said the first word to her about my doing this, but I have watched in the past, and I also come behind her and re-rinse the containers she has already rinsed. She has obviously picked up on this. We are enjoying an unusual Sunday morning at home today. She told me last night that she was thinking of not going to church today. She re-confirmed that this morning. I decided to follow suit as there was no regular Sunday school this morning. We have been active the past few days. Friday night we went to a play at the Bijou. They performed Young Frankenstein by Mel Brooks. It was a wild comedy. It was not exactly our kind of thing, but we do share a love for theater. We will continue to attend as many theater performances as we can. I am optimistic that we will have a couple of more years to enjoy them. Yesterday afternoon we went to lunch at a small café on Millwood and then drove to The Flick planning to see Belle. It turns out they were sold out for the 2:30 movie; so we bought tickets for the 5:00 show. We came back home in the interim where I solved a syncing problem involving my iPad and computer. We went back to the show and enjoyed it. It was the best movie we have seen in quite a while. Since we were so close to Casa Bella, we went there for dinner following the movie. I hope our activity is something that would be encouraging to anyone else in our situation. We have had almost 3 ½ good years since Kate’s diagnosis, and we continue to enjoy life. We’re going to keep it up as long as we can. I have found that so many things are happening I can’t remember to report on all of them. In an effort to do a better job covering what’s going on, starting today I am going to attempt to write daily updates. I may not be as detailed, but I hope to write more often. Yesterday was a good day. I took Kate for a haircut at 9:00. While she was there, I went to Barnes & Noble, got a cup of coffee and checked email. I find this to be quite relaxing and today it took a little longer since Kate was also getting color this time. When she finished, I got a call from her hairdresser’s daughter telling me Kate was ready. I had made sure that Kate had her phone with her; so I wonder why she didn’t call me herself. Perhaps she forgot she had the phone. In the past few months, she has used her phone much less and usually doesn’t have it with her. That may be because she doesn’t usually have her purse with her. That is to prevent forgetting it. When I got to the hairdresser’s, Kate asked me if I had the money to pay. I told her I had given her the money. She didn’t remember at all. I told her that it was in a pocket in her purse. I showed her, and she paid. This conversation was in front of her hair dresser, her daughter, and one other customer. This kind of thing makes me think that surely they know about Kate’s AD. From there we went to Belk’s where I bought some new athletic socks and Kate got hose that she has desperately needed. We also got some new towels for our bathroom, the first since we moved in almost 17 years. Kate also bought some new sunglasses. I wanted to discourage the purchase, but she really wanted them. She has sunglasses although she doesn’t know exactly where they are. This is but one example of when I feel the priority should be on other things. For example, she needs more casual clothes that fit her. She doesn’t seem to feel the same need. At my suggestion, we went to shop for slacks after leaving Belk’s. She didn’t find anything. I will continue to push on this although I have to be gentle. We had lunch and went back home. She got ready to go to a funeral over an hour earlier than departure time. Then when it was time to leave, she couldn’t find her shoes and had to wear a different pair. We went from the funeral to get a sandwich and salad for dinner. She just had iced tea. We got home at 6:30, and she changed clothes before going outside to work in the yard. We were going to watch a movie, but she didn’t come in until almost nine o’clock. She thanked me for letting her stay out and commented on how good she felt. We both mentioned how much working in the yard is like therapy for her. It is really amazing. Thus it was a good day. She was excited about today as well because the woman who helps with landscaping came over at 9:00 this morning to spread compost in the flower beds. The Robinsons visit last Wednesday was a good one. It gave Kate a psychological boost. It was a non-threatening experience in which she could chit-chat on routine things and things from the past. I find that all experiences whether it is a good movie, a theater production, time with friends, eating out, etc. play a part in keeping her spirits up. I don’t mean that she gets depressed regularly. She does not. It’s just that she enjoys having things to do. That is increasingly important as her ability to do some things decreases. We have been pretty active in the days since the visit. One of the things that she has enjoyed most was a book festival. We went on Saturday and Sunday specifically to see and hear one of my former clients who has written a book about his experiences in public relations. In addition, we browsed through the vendor area and saw a number of people we know in the hallways and in sessions we attended. Kate got depressed when she was getting dressed for church. She had a hard time finding something that fits. This kind of situation occurs more frequently now. While the fundamental issue is her weight, I have tried to see that she has slacks that will fit. As I noted in one or two earlier posts, I took her to buy clothes about 6-8 weeks ago. We got 5 pair of slacks and several tops to go with them. She has rarely worn them. I assume that is because she forgets she has them. I have put the new clothes right at the front of the closet so that she can find them easily, but I am now assuming that she customarily has put things in some other location. I need to be more conscious of when she is getting dressed and helping her pick out things. The problem with this approach is that she is coming to resent my help thinking that she doesn’t need it. For months I have been keeping Kate’s debit card and her driver’s license. That has led to a couple of problems lately when she went out to lunch with Ellen and another friend and didn’t have money to pay. They paid and I paid them back. To avoid this situation, I just put Kate’s cards on her dresser so that she would have money when she goes to lunch tomorrow with Ellen. She was a little irritated and asked if we couldn’t just keep the cards on the table next to her side of the bed. I said that would be all right if she would make sure they stayed there. She looked at me seriously and said, “why wouldn’t I?” I told her we would talk about it later. She really could not imagine why? This is something that concerns me because it suggests she is less cognizant of her condition than she has been in the past. As we were preparing to leave the Residence Inn in Lubbock, Kate made a point of telling me she was taking her computer on board the plane to Knoxville. I told her she seemed quite insistent on that. She said, “I thought you would tell me not to take the computer on board; to take the iPad.” This is an illustration of the frustration she is having with me and the irrational thinking that is becoming more common. Of course, she was going to carry her computer on board. That is what she always does. Sticking to a time schedule is a consistent problem. For example, at 8:30 I told her that breakfast would end at 9:30. I said that she did not have to rush, but I wanted to let her know how much time she had. At 8:50, I told her she had 30 minutes to get ready. She was still in bed. She was still getting ready (slowly) at 9:17 when I told her I was worried that she was going to miss breakfast. We left and made it. Without my pushing, she would never have made it.